The rail system used is an all steel rail with a rail cost of under $1 per foot. For 1-1/2 inch scale the system could be used to build steel rail for $0.40/foot. Rails are made from 3 hotrolled steel flats jig welded to form a 1- 1/2" high rail on a near West coast cross section. Joints provide 8" overlap and are welded to the right side of each end of the rail to provide maximum strength to each joint. Joints made this way remain true even on curves and under heavy load. Pairs of joints are bolted with 4- 5/16" bolts/nuts. A good days work can produce over 300' of rail in 20' lengths. With a savings of more than $1/foot over 6061 aluminum rail, that is a pretty good wage!, and it is steel! 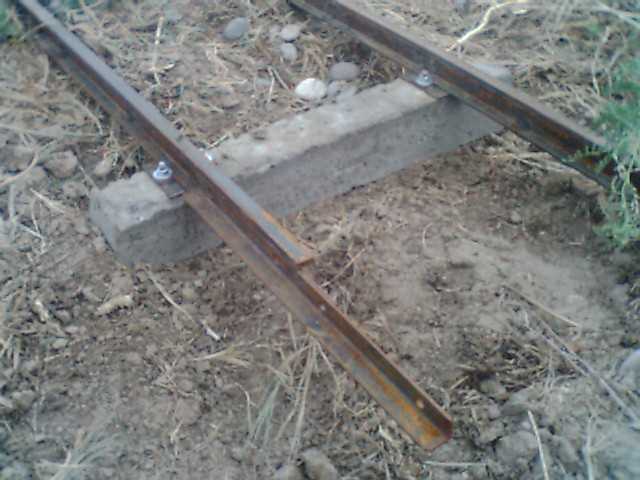 Tie plates are used to connect the concrete ties to the rail. These plates are made from 3 pieces of hot rolled steel strip. 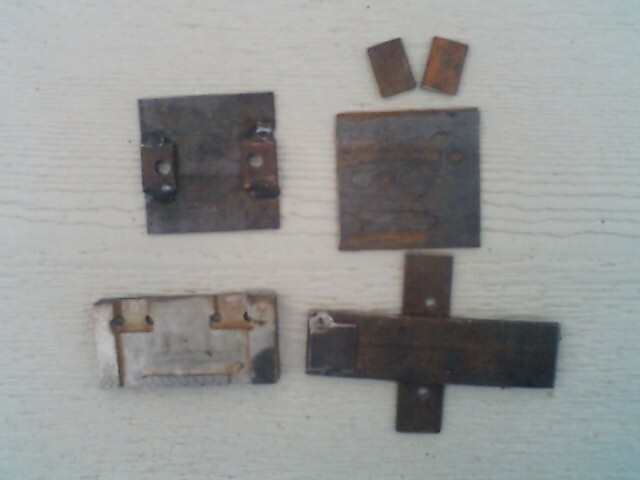 Left; clockwise from upper left: complete welded and drilled tie plate, 3 cut parts, simple drillpress jig, welding jig. You can see the assembled tie, tie plate and rails in the image above. More information on rails and turnouts coming soon.